Welcome again to the monthly newsletter from Chiropractic Help. This month we feature some lower back exercises that will take you less than two minutes, prevention of breast cancer and the beauty of the lima bean. I wanted to name this page "spinal rehabilitation", or at least something to do with rehab, but it seems that word has more to do with drugs and alcohol than preventing that most nasty condition, spinal stenosis. Spinal stenosis afflicts mostly the older person. Sixty plus. After serious injury causing conditions like SPONDYLOLYSTHESIS a not uncommon condition caused by a fracture in the lower back in childhood when the spine is still made of cartilage, or repeated SLIPPED DISK ( slipped disc ) or LUMBAR FACET SYNDROME episodes. Degenerative changes of the joints begin to threaten the spinal cord and spinal nerve roots from either the anterior, or posterior, or both. It is a fiercesome condition, causing tingling in legs and feet, and if it occurs in the neck then tingling in arms and hands. The cost of treatment is exhorbitant, the pain and suffering unbelievable. Prevention and rehabilitation of spinal injuries is the key. Don't let SPINAL STENOSIS happen to you, if you can possibly help it. In the last month I have had two men in their forties with severe lower back pain. Both have had repeated episodes over the last years. Both responded well to Chiropractic care and were relatively painfree within a couple weeks. One took my advice seriously. He has come into our rehab program using SPINAL STENOSIS EXERCISES; the other said it was too expensive (a mere 3-5 consultations and an occasional but regular treatment) and since he has no pain, why should he bother? Do you regularly look like the leaning tower of Pisa? Be sure, if you don't NOW consider SPINAL STENOSIS EXERCISE the likelihood of drama in the future is relatively great. It's a fact that care of the lower back has the highest cost tag, because of lower back surgery ... but it only happens to other people you think! Wrong. Repeated episodes of lower back pain inevitably increase the likelihood of numbness and pain and tingling in legs and feet. My spinal stenosis exercise programme takes only one and half minutes every morning. I do it myself. Done on your bed first thing in the morning, simple exercises like these WILL make an enormous difference to your back. I particularly like this modified pelvic tilt because it not only improves your muscle tone, but the gliding action of the facets reduces the tendency to immobilisation arthritis ... the inevitable result if spinal fixations are not properly managed. In Chiropractic, we encourage you to become actively involved in the care of your spine. In this instance that means spinal stenosis exercise. Prevention is the word. Take it seriously, really, it can happen to you. YOU! The first step is to have your low back pain carefully and properly treated. Of course, I have a vested interest and would like to see you consult a chiropractor, but at least see someone you trust who can manage your lower back pain. This elderly lady could barely walk, so severe was the pain in her back, and the pain and tingling in her legs and feet, when she first came for chiropractic care. Yes, she has osteoporosis, and Medicine says that no woman of that age, in her right mind would consult a chiropractor. "It's far too dangerous, they might break your bones." Ribs, yes, eight at last count in thirty-two years. Vertebrae? Absolutely not. 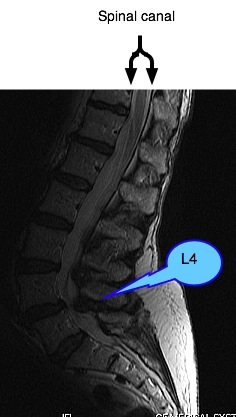 Notice how the spinal cord is under pressure at the L4 level, low in the back. Chronic repeated lumbar facet syndrome injuries have caused serious degenerative changes posteriorally, threatening the cauda equina. Extension of her spine caused severe pain down her leg. She now comes once a month for chiropractic care, to maintain the progress in her condition, but everything hangs on these spinal stenosis exercises which she does faithfully. One and half minutes, that's all they take. She can now walk for half an hour before the pain begins. "Praise out of season, or tactlessly bestowed, can freeze the heart as much as blame." This month we look at breast cancer and what you can do to prevent it. It's not good taking the ostrich approach, one in eight women get breast cancer and, just like prostate cancer in the male, breast cancer is one of the most de-humanising diseases. Prevention not only makes sense. It's also relatively simple, and good for your whole health. Eat fish like salmon and mackerel at least twice a week for their rich supply of omega-3 essential fatty acids and vitamin D, both important in the fight against breast cancer. Every woman should be walking daily anyway, because top of the list of the causes of osteoporosis is the office desk, the computer, the television and the couch potato lifestyle in general. There is heaps of evidence that walking, cycling, gardening, swimming... you choose your favourite activity... reduce the risk of breast cancer. Get away from the computer and the TV for at least half an hour a day. Double win from outdoors activity. The vitamin D not only reduces osteoporosis, but also is one of the main avenues of attack on breast cancer. Wear a hat. Food-rich anti-oxidants like magnesium, zinc, selenium, and vitamin C and E should be on the menu every single day. Because it's possible to overdose on minerals and some vitamins, you should always rely on getting them from your food rather than out of a bottle. Plus, there are so many, you'd be swallowing dozens of capsules every day. That would make the vitamin companies happy, but not necessarily enhance your health. Use the Search this Site function at Chiropractic Help to read about the benefits of avocado, tomatoes, mushrooms, broccoli, strawberries, mussels.... all rich in anti-oxidants. About 8% of cancer is caused by medical ionising radiation, including X-rays. Always question whether the test is really necessary, and whether an MRI could be done instead. Expensive. Can the breasts be covered with lead shields? It's a toss-up with mammograms. I would avoid unless you are at high risk, in favour of an annual physical examination by your gynae, and then a mammogram only when demanded by him/ her. Many industrial chemicals found in pesticides for example, and the hormone residues in meat have estrogen-like activity increasing the risk of breast cancer. In general do your best to avoid chemicals, use gloves and if necessary a mask. Cutting out all fat in the diet is seriously dangerous, but so also is too much fat. There is a strong association between a high fat diet, obesity and breast cancer. Try to get as much of your fat as possible from the olive and the avocado, and of course fish or flax seed oil. Likewise, dairy products are a double wammy unless you can find a source of eco-friendly milk and cheese. The high saturated fat and residues of bovine estrogen that virtually all cows are injected with to increase milk production are extremely dangerous. I too love my dairy, but it is wise to limit them, and take with high fibre foods. Moreover, not only is there a strong association between red meat and breast cancer, but also how it's cooked. Avoid well-done meat, particularly that exposed to very high temperatures. BBQ meat should be cooked for as short a period as possible. Having lost so many patients over the years, I am now utterly convinced that only a tiny group of women should be taking hormones after menopause. The well-proven risk is high. Serious depression is perhaps one reason, but the oft-peddled reason, osteoporosis, I believe is grossly over-used. Hormones are a cheap and nasty substitute for a proper exercise and diet programme. Google hormones and breast cancer. You'll be shocked. It's pure coincidence, but not inappropriate that we feature this month another bean along with breast cancer. As stated above, there's a definite association between breast CA, and perhaps all CA and red meat. 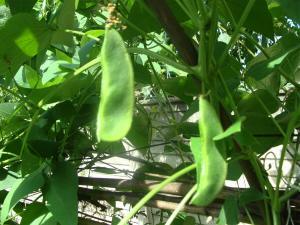 Moving steadily away from meat, cheese and eggs to legumes for our protein makes eminent sense. And in any case, lima beans are delic, though difficult to get fresh. Grow them! Up a lattice work of sticks they are really very easy to grow, and take up little space. 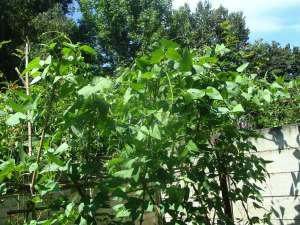 Plus, legumes put nitrogen into the soil for your next crop. Dried lima beans are called "butter beans". You're unlikely to have someone ask you at a cocktail party if you've had adequate molybdenum, a trace element, like you might be quizzed over your vitamin C or zinc. However, molybdenum is, along with zinc, selenium and copper, vitally necessary for utilization of oxygen in the cell, DNA and RNA reproduction, destruction of the free radicals that cause cancer and sustaining the integrity of all cell membranes. A deficiency causes vague symptoms like malaise ("I'm just not feeling well"), loss of appetite and low level obscure neurological symptoms like tingling in feet and legs and arms and hands ... which are very difficult to diagnose. On the other hand, toxicity from too much of these minerals also causes serious illness with flu-like symptoms, odd Central Nervous sytem signs, nausea, diarrhoea, and anemia. Equally difficult to diagnose. The rule of thumb is: get most of your minerals and vitamins from your food, eating from as wide a spectrum of foods as possible. Lima beans are particularly rich in molybdenum. There are many different varieties of Lima Beans, yes, indeed they come South America. Spanish conquistadors wrote not only of the abundant silver found in Peru, but of the delicious beans they found in Lima. We'll be enjoying these limas in less than a week. Perhaps you think it's far too time-consuming and boring to grow and prepare these foods, but just think how time-consuming spending hours in a hospital having a breast amputation will be, radium treatment, losing your hair... prevention is the name of the game. My book of the month is my own, and has nothing to with Chiropractic. However, if you've enjoyed my Chiropractic books like STONES IN MY CLOG then perhaps you'll enjoy this trilogy, A FAMILY AFFAIR. Written in a quite different genre, they cost only 99c each. Enjoy the low cost of ebooks. Yes, that's right! 99 US cents. PS. Feel free to forward this to family and friends.